TORONTO THEN AND NOW ... Over the past few years, I have started amassing a digital archive of photographs, showing the history of the City of Toronto. I really love comparing what Toronto looked like in the past with what it looks like today. So, I decided to share what I've found with everyone else, and that's what this "blog" is for! I'm glad that you found me. Enjoy the photographs, dear reader, and thanks for stopping by! Well, after a long hiatus of over a year, I've decided to put up another post here in my collection of anecdotal tales of Toronto's history. The patriotic inspiration for this was the fact that another Canada Day is upon us. I'm only one year overdue for posting in time for Canada's 150th, which took place last year, but hopefully any reader will find this almost as informative and entertaining for Canada's 151st. The title of this post, referencing "Canada Day" is of course misleading. Traditionally, July 1st had most commonly been known as "Dominion Day". This alluded to the British North America Act, which made reference to the country as a Dominion. 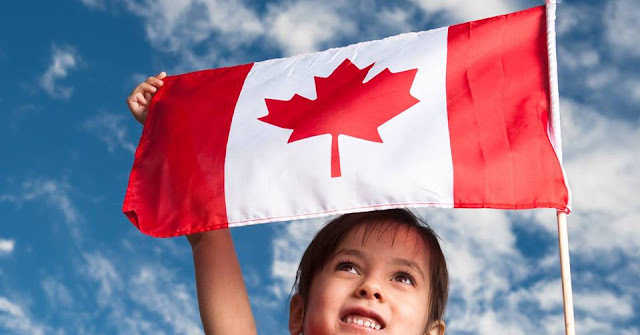 There were suggestions to change the name of the holiday to "Canada Day" as early as the 1940s, but it wasn't officially changed until 1982. 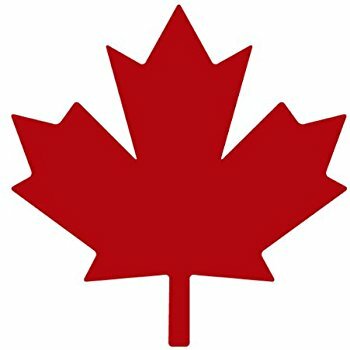 Although some traditionalist Tories and historical diehards may still refer to the day as Dominion Day, most people these days of course refer to July 1st as Canada Day. So, to begin, back in 1861, a few years before Confederation, Toronto had a population of 65,000. We were the most inhabited city in the Province. Only Montreal, with its population of 90,000 people, was bigger. And with Canadian Confederation, we were set to become the capital of the brand-new Province of Ontario. An article in the Globe newspaper, operated by George Brown, one of the Fathers of Confederation, laid out the festivities held in Toronto to celebrate the creation of Canada, on Monday, July 1st, 1867. The old Cathedral Church of St. James had been destroyed by fire in 1849, and the main body of the church was re-opened to the public in 1853. As the photograph of the cathedral in 1867 shows, the spire was not yet complete, and wouldn’t be completely finished until 1874. But enough of the spire had gone up to house the bells, which had arrived in Toronto in 1865, two years before Confederation. 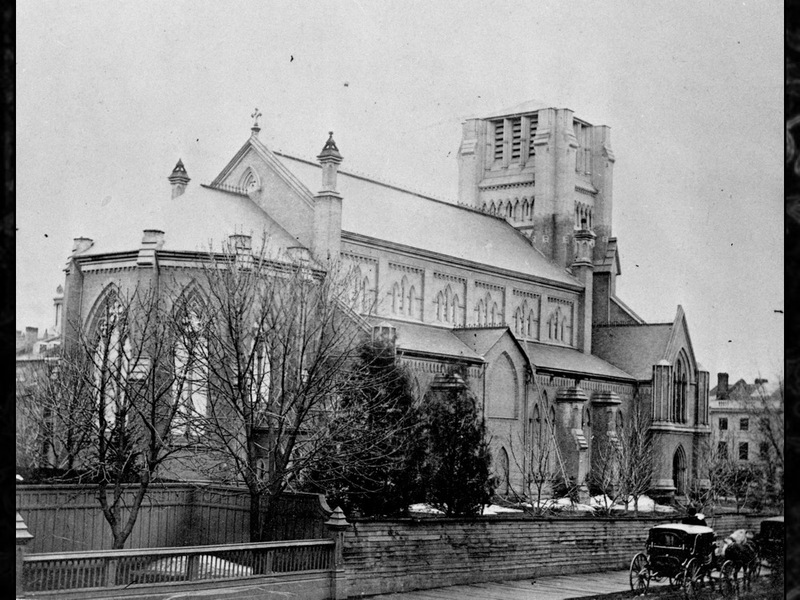 The Cathedral Church of St. James, at the northeast corner of King and Church streets, in 1867. The first set of bells for the Cathedral were lost in a shipwreck off Rimouski, Quebec. A new set of nine bells were imported from the United States, and made the final leg of their journey along King Street by horse-drawn carriage in 1865. 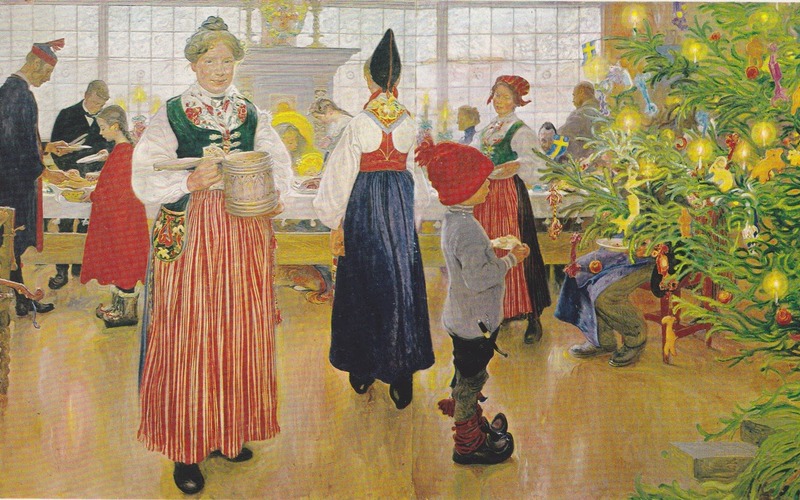 When they were first rung at Christmas that year, an article in the Globe newspaper wrote how “the heart of many an old countryman was warmed again by those old familiar sounds which delighted him in years gone by in his native land.” These same bells are still used 153 years later, in 2018. 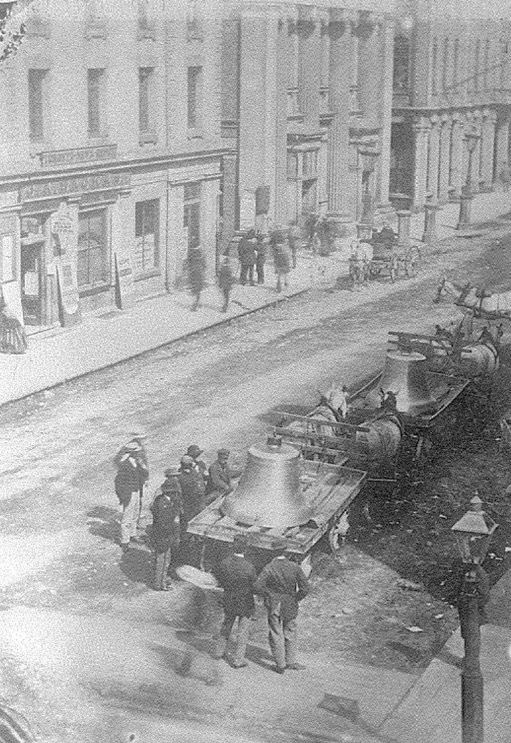 Transporting the new bells for the Cathedral Church of St. James along King Street, Toronto, 1865. The small arms fire was thanks to a detachment of the 10th Battalion, Royal Regiment of Toronto Volunteers. They assembled outside their drill shed and hoisted the Royal Union Flag, as well as their own Regimental Colours. The Royal Union was given a 21-gun salute at about 4 o’clock in the morning, no doubt to the great delight of the neighbours. The Royal Regiment of Toronto would eventually become the Royal Regiment of Canada. At six o’clock in the morning, a large ox was put on a spit at the foot of Church Street. 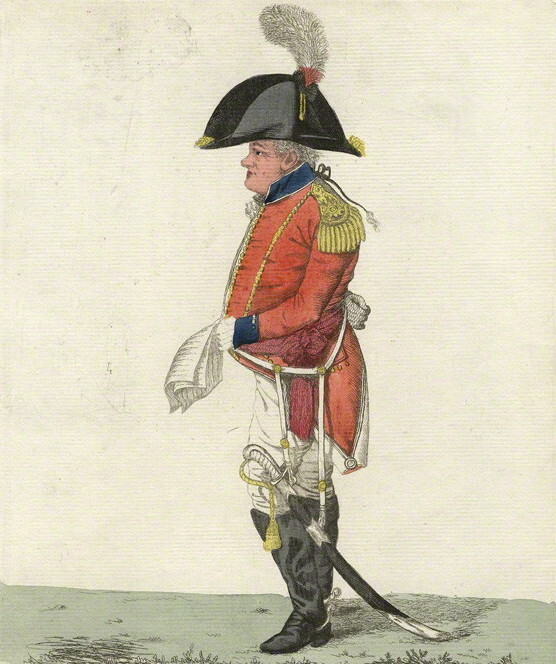 One Captain Woodhouse, who commanded a ship called Lord Nelson, was in charge of the patriotic barbecue. The animal had been purchased from a butcher named Joseph Lennox, up in Yorkville. 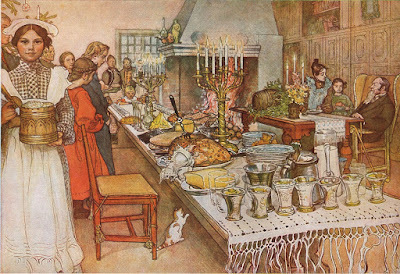 The Globe noted that the ox would take most of the day to roast, and leftovers would be distributed amongst the city’s poor. The Daily Telegraph newspaper also noted that parts of the ox were given to two different charities for children. The Protestant Orphan’s Home had opened in 1854, on Sullivan Street, between Queen and Dundas streets. 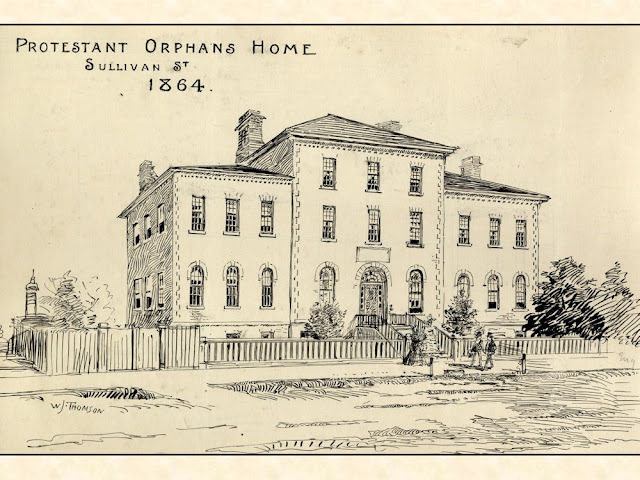 It struggled to accommodate the flood of immigrant children to Toronto, or those who had lost their parents to cholera and the other lethal diseases that swept through Toronto at the time. 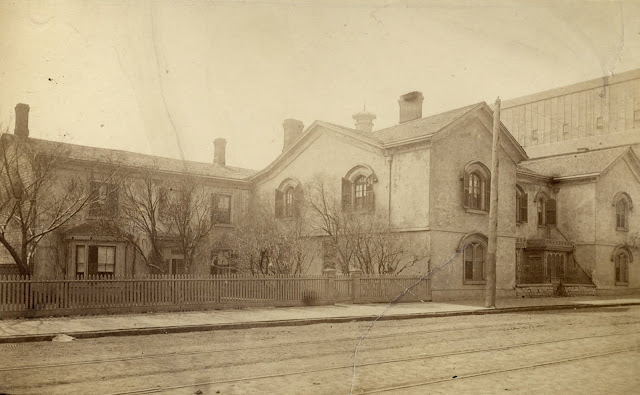 The House of Providence stood on Power Street, south of Queen Street. Opened in 1857, it was operated by the Sisters of St. Joseph and the Roman Catholic Church. 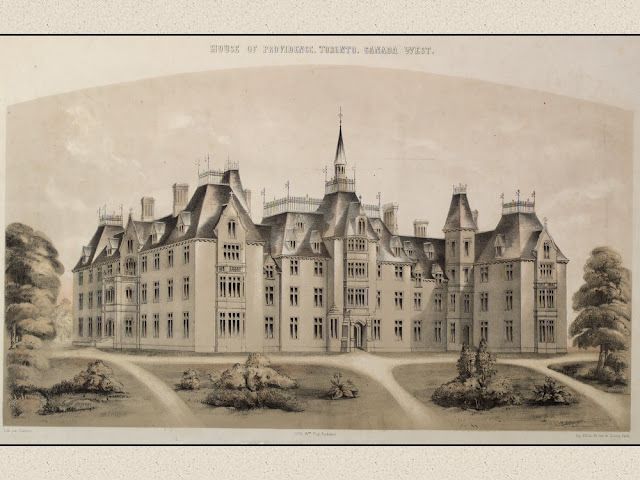 Nearly always full, the institution would eventually quadruple in size to provide for about 700 residents, including the unemployed, orphans, the elderly, immigrants and widows. Some stayed for a few days, while others were there for years. 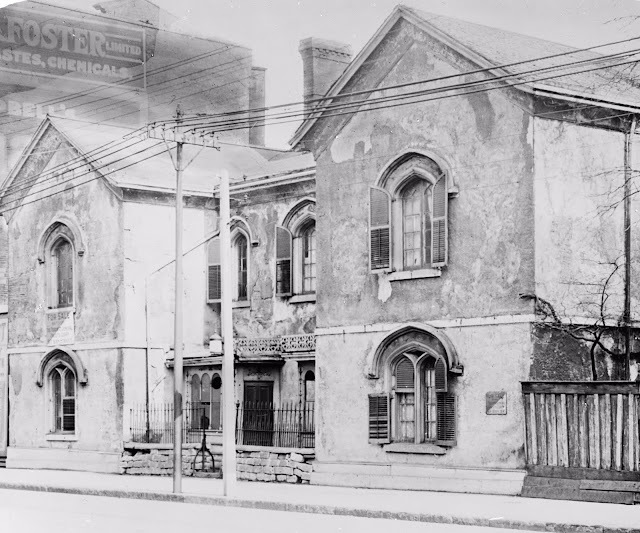 The House of Providence lasted for over a century before it was demolished in 1962 to make way for the Richmond Street exit from the Don Valley Expressway. Toronto’s church-going faithful also sought out their own edification when Canada became a country on July 1st, 1867. Some assembled at 9:30 in the morning, in the lecture room of the Mechanics Institute at Church and Adelaide streets. They were there for a meeting of the Toronto Branch of the Evangelical Alliance, and “Christian persons of all denominations” were “invited to attend at that hour to invoke the divine blessing of the new Dominion”. The Toronto Mechanics’ Institute had been built in 1853. Paying members could attend lectures and courses and use the library. 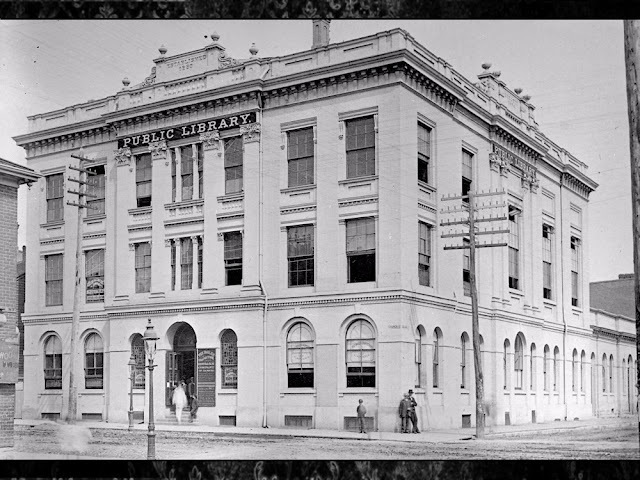 In 1883, the institute was given financial support by city council, at a time when no other city in Canada had a completely free public library. So, the Mechanics’ Institute became the nucleus of the first public library system in the country. The building was demolished in 1949. 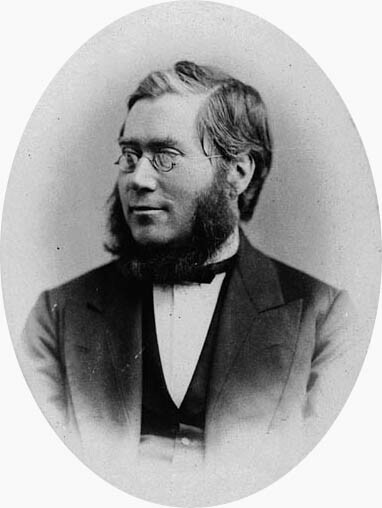 Oliver Mowat was the most notable speaker at the religious rally held at the Mechanics’ Institute on July 1st, 1867. He was vice-chancellor of Evangelical Alliance, a Father of Confederation, and a rival of Sir John A. Macdonald. Mowat wanted strong provincial autonomy, where Macdonald envisioned a very centralized federal government for the country. Mowat served as Ontario’s third premier for 24 years, from 1872 until 1896. He then served as Ontario’s eight lieutenant-governor, from 1897 until 1903. Mowat was Ontario’s first great leader, and made the province the richest in Canada. It was under Mowat’s leadership that Ontario’s agriculture was modernized, industry was expanded, areas like education and science were cultivated, urban social problems were addressed, and electoral reforms like voting by secret ballot were introduced. If Macdonald was the “Father of Canada”, then Mowat was the “Father of Ontario”. But, back to Toronto during the celebrations of Canadian Confederation. They continued all day long. A military review and parade was held on public commons along Spadina Avenue, south of College Street. The afternoon saw a picnic and festival in aid of the new St. Patrick’s School House, and a church on Dummer Street. The Horticultural Society put on an evening concert and dance, with music supplied by two military bands. 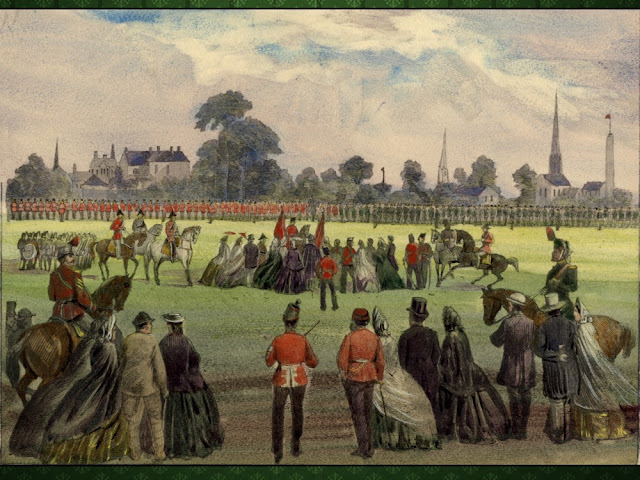 The Public Commons, Spadina Avenue, south of College Street, hosted a military review and parade on July 1st, 1867. Fireworks were set off at Queen’s Park at about 9 o’clock that night, and the park itself was illuminated by lantern light. The area was still mostly a public park at this point, with the parliament buildings still down at Front Street. Today’s legislative assembly wasn’t built on this spot until 1893, and the only building in the park was King’s College, which had been abandoned in 1859 in favour of University College. Monday, July 1st, 1867 was a public holiday across the new Dominion. 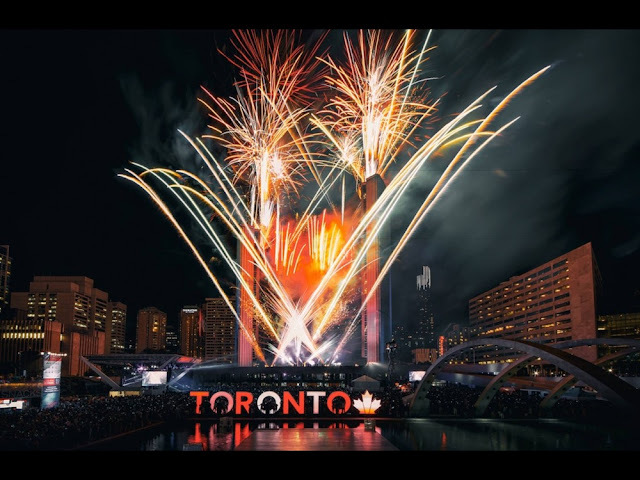 Businesses were closed, and Toronto celebrated with public musical recitals, choirs, military parades, pageants and picnics, and topped it all of with night time fireworks. At the heart of it all, it doesn’t really sound too different from how we celebrate July 1st these days. Sure, those partygoers from 151 years ago wouldn’t recognize the Maple Leaf Flag, and they’d probably be more than a bit startled with what we can do with modern day fireworks. They’d have no idea what a “Canada Day” actually was. But I found it curious that, in spirit, anyway, a lot of our public observances are the same as they were 151 years ago now. However you are commemorating Canada Day this year, I hope it's a fun and relaxing one. A simple internet search will reveal a number of "Top Ten" lists of special concerts, fireworks displays, markets, food festivals and activities that are available over this long weekend. As usual, my choice is mostly for the historical, and three of the City of Toronto's historic sites are putting on special events. 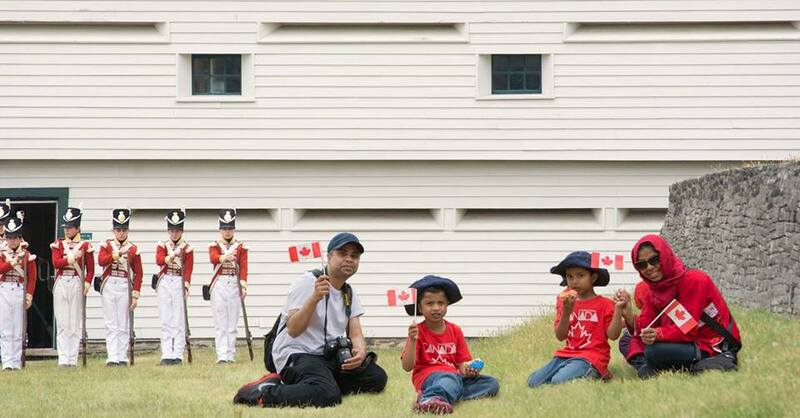 These are Fort York National Historic Site, Mackenzie House Museum and the Scarborough Museum. "In addition to flag raising and flag lowering ceremonies, the Fort York Summer Guard, dressed as members of the Canadian Regiment of Fencible Infantry (circa 1815) will perform demonstrations of musketry, artillery and fife and drum music. Children can enjoy a drill activity, music classes, and a scavenger hunt. The Fort's volunteer historic cooks will demonstrate period-specific cooking methods and recipes in the historic kitchen." "Looking for a unique and memorable Canada Day? Scarborough Museum hosts their annual celebration in Thomson Memorial Park. Demonstrations include historic blacksmithing, spinning, weaving and leather working. Don't forget to check out the Scarborough Historical Archives tent and browse through archival aerial photographs, maps, and lots of information not he history of Scarborough. The museum's annual pie eating contest is also back by popular demand. Finally, enjoy celebratory Canada Day historic treats and stroll through the vendor markets." Celebrate Canada's birthday with a visit to Mackenzie House, the home of Toronto's first mayor! 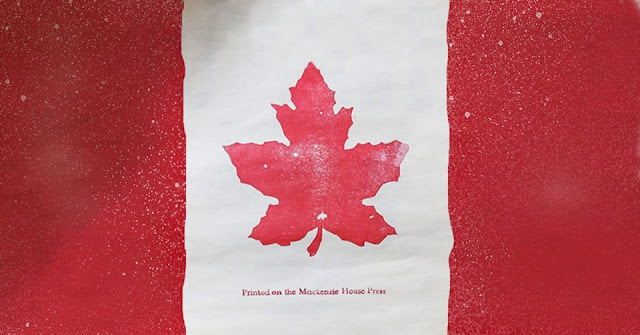 Visitors can use the 1845 press to print their own Maple Leaf postcard. For frequently updated historical photographs of Toronto, follow me on Instagram! My Instagram ID is "fiennesclinton"
WHATEVER HAPPENED TO QUEEN VICTORIA? About two years ago, I came across a photograph in the Toronto Public Library Archives, showing a statue of a young-looking Queen Victoria. 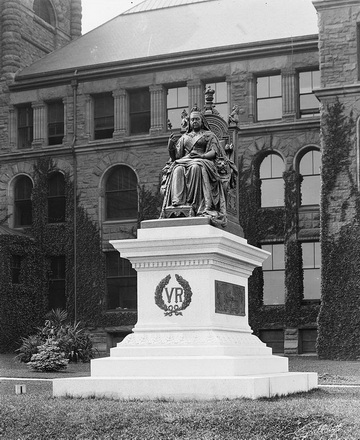 The only hint to the history of this statue was the photograph’s caption which read “Victoria, Queen, monument, Queen’s Park, at head of University Ave.”. I was intrigued. If you’re familiar with the area, then you’ll know that there is a large statue of Sir John A. Macdonald on that spot, and it’s been there for years. 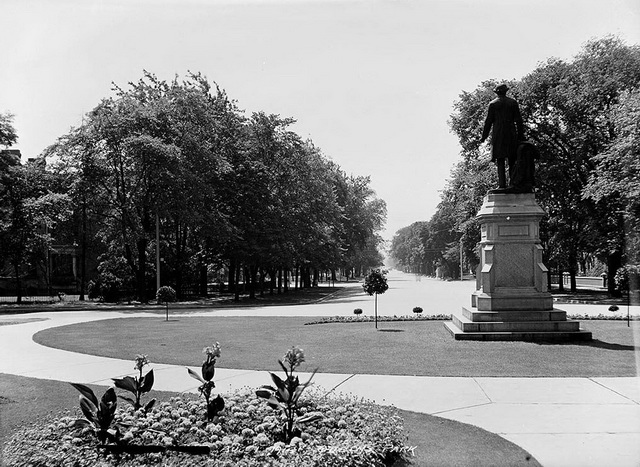 This photograph from the Toronto Public Library Archives shows the statue of a young Queen Victoria that once stood on the south lawn of Queen's Park, gazing down University Avenue. Sir John A. Macdonald would eventually usurp the Queen's place on the front lawn of Queen's Park. This picture shows him peering down University Avenue about 1914. I forgot about the mysterious statue for a while, until my interests were revived over this past weekend. With another Victoria Day here, and all the talk about Canada 150, and recognition of Queen Victoria as the “Mother of Confederation”, I once again looked into finding out whatever happened to this statue. The location of any such statue of Queen Victoria at Queen’s Park is appropriate enough, at least in terms of geography. The area was opened as a park almost forty years before the legislative assembly building first went into use. It was opened on September 11, 1860, by none other than the Prince of Wales, eldest son of Queen Victoria and the future King Edward VII when he was in Toronto as part of a Royal Visit to Canada. The young prince named the park “Queen’s Park” in honour of his mother. Apparently, there are more schools, streets, parks and public spaces named after Queen Victoria in Canada than in any other country in the world. Queen Victoria had a long reign of nearly 64-years, and Canada is a pretty big country. Here in Toronto, we had a few things named after her during her lifetime. There was Queen’s Park, as I’ve mentioned. Lot Street was renamed Queen Street in 1844, and Upper George Street became Victoria Street that same year. The University of Victoria College moved to Toronto from Cobourg, and the old Victoria Hospital for Sick Children opened on College Street in the 1890s. But there was no statue of Queen Victoria for a considerable length of time. Then, along came a man named Marshall Wood. He was born to a family of sculptors in 1834, just three years before Victoria came to the throne. Some critics seemed to think that Wood’s work wasn’t really high art, but instead, he made a living by selling his work. It seems he was something of a door-to-door, or perhaps, a nation-to-nation statue seller. 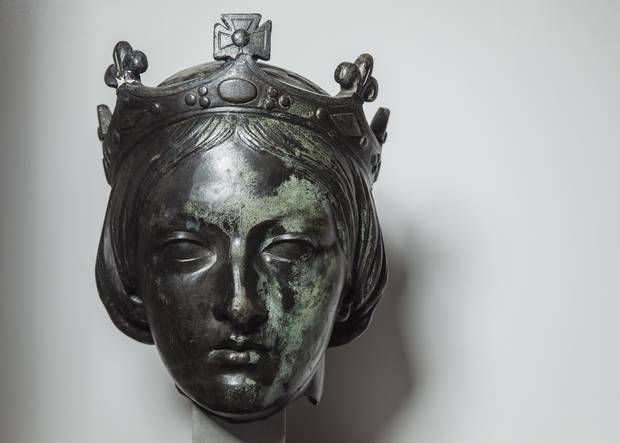 Queen Victoria had a lot of loyal subjects, given how extensive her empire was, so he probably guessed that she would make a profitable “subject” for his sculptures herself. He ended up selling statues of Queen Victoria to other cities in Canada, Australia, and even India. Marshall Wood brought a statue of Queen Victoria to Toronto, and our city council gave him permission to put up the statue at the base of the lawn at Queen’s Park, at the top of University Avenue, as noted. It was installed in April of 1871. The statue portrayed Queen Victoria as a young woman, which is a bit of a refreshing change for those of us today who are used to seeing her portrayed as an older woman in constant mourning for her beloved consort Albert. The statue was made of bronze, and stood on a wooden pedestal. Of particular interest are the cannons that flank her statue. They seem to be the same cannons that are now positioned on either side of the main entrance to the legislative assembly building. These were captured Russian cannon, taken by the British during the Crimean War. The metal from other similarly captured cannons would go on to be used to make each Victoria Cross, which remains the highest military honour both in Canada and throughout the Commonwealth. 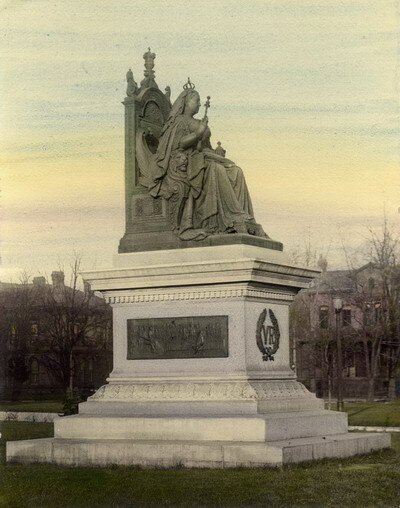 Marshall Wood had been in Canada to attend the unveiling of a very similar statue of Queen Victoria that he had produced for Victoria Square in Montreal. So, he extended his trip to include Toronto, brought the statue that was located here as a sample of his work, and put it up in Queen’s Park, which would have been a suburban idyll near the north end of the city back in 1871. The municipal committee responsible for such things recommended buying the statue for $3,000. The cost was debated in City Council for some time, but a consensus was never reached. Some of our more pragmatic aldermen of the day thought the price was too high, or that it wasn’t a very good likeness of the Queen. About two years after the statue was installed, city council finally voted against paying for it. They asked Wood to take his statue away in 1874. It was thrown into storage for about twenty years before it was taken to Quebec City and put into that city’s Victoria Park in June of 1897. Queen Victoria was celebrating her sixtieth anniversary, or Diamond Jubilee, as sovereign, and there were celebrations the world over (or, at least in the parts she was in charge of, which were plenty). Queen Victoria’s statue would regally reign in Quebec City for just over 66 years, which was a couple of years longer than the reign of the actual Queen. Then, at about 3 o’clock in the middle of the night of July 12th, 1963, a blast rocked the city. It was the height of the Quiet Revolution, the Sovereigntist movement in Quebec, and the FLQ crisis. Someone had planted explosives at the base of the statue in Quebec. When the smoke cleared from the bomb blast, Queen Victoria’s head was lying about 90 metres away from her body. In something almost reminiscent of poor old King Charles I, the statue of Queen Victoria was decapitated. Uneasy lay the head of anything that the most fervent FLQ members regarded, rightly or wrongly, as a symbol of British colonialism. 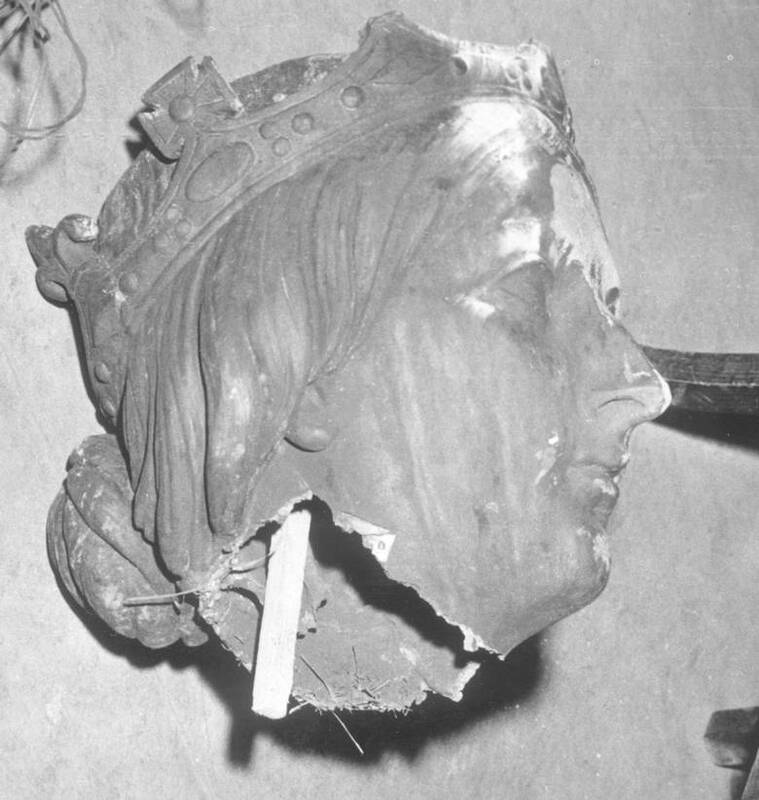 The decapitated head of Queen Victoria's statue after it was blown apart by separatists in Quebec City. Art historian and museum curator Vincent Giguere checks out Queen Victoria's body. Here's another detail of the Queen's head. 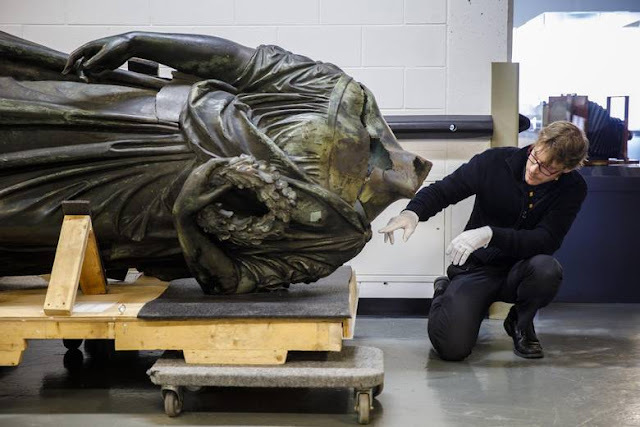 The two main pieces of the statue, head and body, were gathered up and since 1988, the body has been on exhibit at Canada’s Musée de la Civilisation, as part of a display on Quebec’s darker days. The head remained hidden away in a museum warehouse. There was talk of restoring the statue and putting it on display again for Quebec City’s 400th anniversary in 2004, but the last I heard, the damage done to the statue was too extensive. There is of course a statue of Queen Victoria at Queen’s Park these days. It’s at the southeast corner of the building, so she no longer gazes straight down University Avenue. That boulevard was rather more majestic in the 1800s anyway, being a tree-lined promenade for carriages and stroll-prone pedestrians, instead of the hectic office and hospital lined street that it is today. Celebrations were held in Toronto, too, for the Queen’s Diamond Jubilee in 1897, and there was talk of a statue commemorating the long-lived Sovereign. 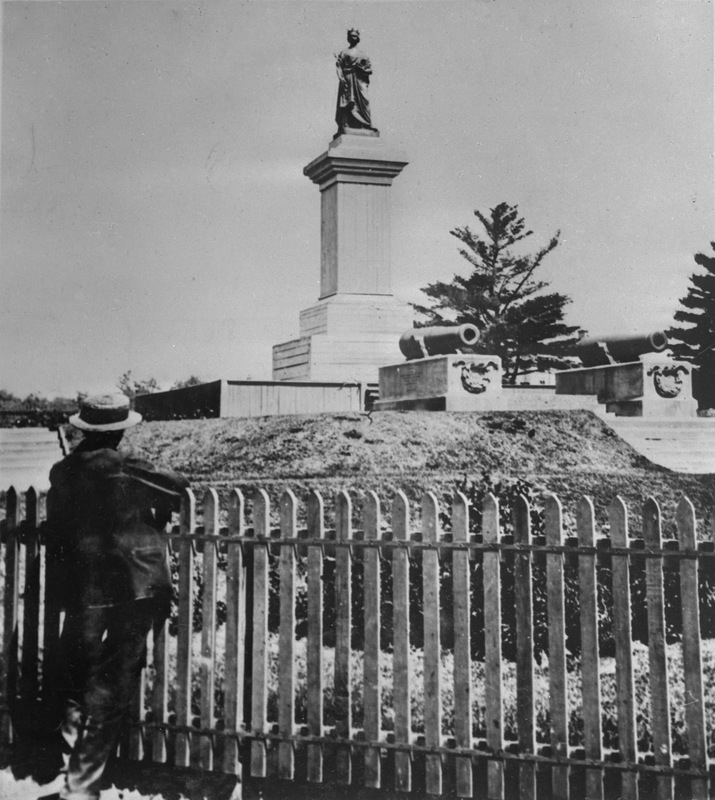 However, the current statue at Queen’s Park wasn’t installed until September of 1902, about a year and a half after the Queen died. Victoria Regina : the current statue of Queen Victoria at Queen's Park in Toronto wasn't installed until 1902. If you look at the postcard on the bottom, you'll note the houses in the background. The area around our legislative assembly was largely residential until development through the early 20th-century. Everyone has heard the old expression that warns us how "those who do not know history are doomed to repeat it". But sometimes, it's hard to glean just what lessons history has to teach us. However, on occasion, history presents us with some very clear life hacks. Such was the case for John White, who made the mistake of sounding off a bit too loudly at a Christmas party that was held in the old Town of York, all the way back in December of 1799. Perhaps the lesson we could all learn from what happened next is that you should always mind your manners and rein in what you say, even at a Christmas party. The Town of York was a pretty small place back then, stretching for a few blocks between George Street and Parliament Street, and from the lake at Front Street, north to Adelaide Street. What is now Queen Street was known as Lot Street, because it was from this thoroughfare that all the countryside estates, or lots, stretched north of the town. It's hard for us to envision a time when anything north of Queen Street was out in the wilds of the countryside and farmland north of town, but such was the case. By the end of the 1790s, the Town of York was home to a few hundred people, and the population was something less than one thousand souls. Other than carving an existence and livelihood out of the wilderness, there wasn't much to do. Mail delivery was thin enough to be nearly non existent. There was a government issued newspaper, but newspapers of the day were only issued once a week, at best. News from the United Kingdom would take about two months to traverse the Atlantic. Keeping an eye on what our American neighbours were doing was more a source of consternation than entertainment, as witnessed by the fact that they would eventually cast an invading eye towards Upper Canada during the War of 1812. The first live theatrical shows in York didn't start up till about 1820. There wasn't even any WiFi. The Town of York in 1803. So, gossip was an important part of everyday life. When the Province of Upper Canada was established back in 1791, it was supposed to be a microcosm of English traditions and institutions. We inherited a number of respectable customs, including English law and the Westminster style of government. But Upper Canada, and particularly its capital, York, were a lot more class aware at the end of the eighteenth century. Any sort of social snub was taken very seriously. A man named John White would soon find himself embroiled in the consequences of just such a matter. John White was an English lawyer who was appointed the first Attorney General of Upper Canada, back in 1791. He came to Kingston that year, and then to Niagara region, before moving to York in 1797. It was John White who bore the responsibility of transferring British law to the colony of Upper Canada. Copies of his diary are held in the archives of the Law Society of Upper Canada, and his letters are housed at the National Archives of Canada. One would think that these would give us great insight into the province's early governance. Instead, White used his diary to record little more than his social engagements. The letters that he wrote back to family and friends in England contained a litany of complaints, about his finances, his marriage, his wife, his health, the backwardness of the colony, the settlers, the threat of American invasion, the cost of construction, the weather, and what what he described as "the lack of rational society". 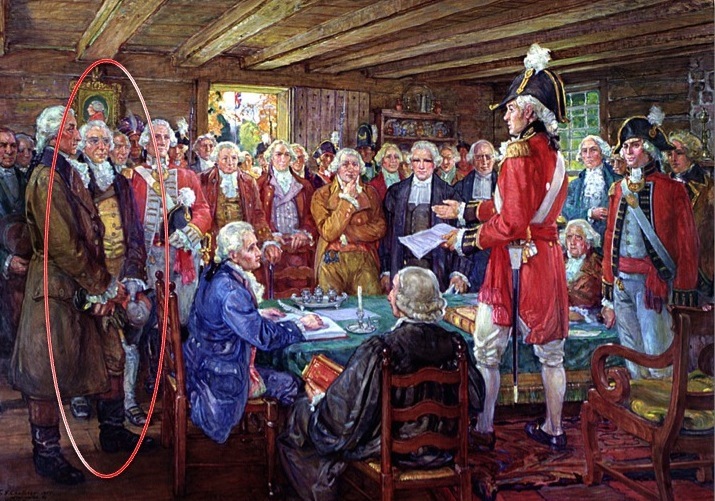 In a letter to his brother-in-law, dated November of 1796, White described himself as "banished, solitary, hopeless, planted in the desert, disappointed and without prospect ..."
This painting shows the very first meeting of the Legislature of Upper Canada, held back in 1791. John White is the second gentleman from the left, in the yellow waistcoat, and is circled. Things would only get worse for John White. He soon found an adversary in Major John Small, who was an officer in the militia, and who was appointed as the clerk of the province's Executive Council. This council served a similar function to the Cabinet back in England. It gave no account to the elected Legislative Assembly, and was often capable of exerting control over the province's early elected officials. Members of the Executive Council were also usually members of the Legislative Council, which acted similar to the United Kingdom's House of Lord, and which also had veto power over the Legislative Assembly. John Small was praised by John Graves Simcoe, the Lieutenant Governor, as "a gentleman who possesses and is entitled to my highest confidence". It seems that Simcoe was one of the few people who actually held John Small in high regard. Small was often criticized for his inefficiency and poor job performance. Small drew a salary of £100 a year, which was less than the wage of some manual labourers, and little more than what Small's staff members made. 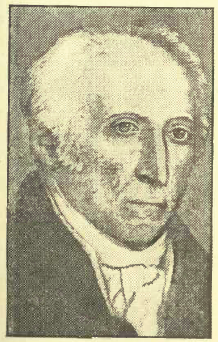 John Small in his later years. The animosity between Small and White was not the result of professional strife, but rather came about due to unfounded gossip. Major Small’s wife, Elizabeth, had snubbed John White’s wife, Marianne, in public, at a time when social slights were taken very seriously. In turn, John White publicly insulted Small’s wife. According to some sources, White attended a Christmas party held at the end of 1799. It was on this occasion that he told a number of York’s finest that Elizabeth Small was lacking in moral fibre and marital fidelity. From everything I've read, Georgian parties sound as if they were heaps of fun. John White supposedly claimed that Elizabeth Small had actually been the former mistress of a British peer, Frederick Augustus Berkeley, the fifth Earl of Berkeley. Berkeley had supposedly tired of the relationship, and paid Small to take her off his hands, and carry her off to the colonies. 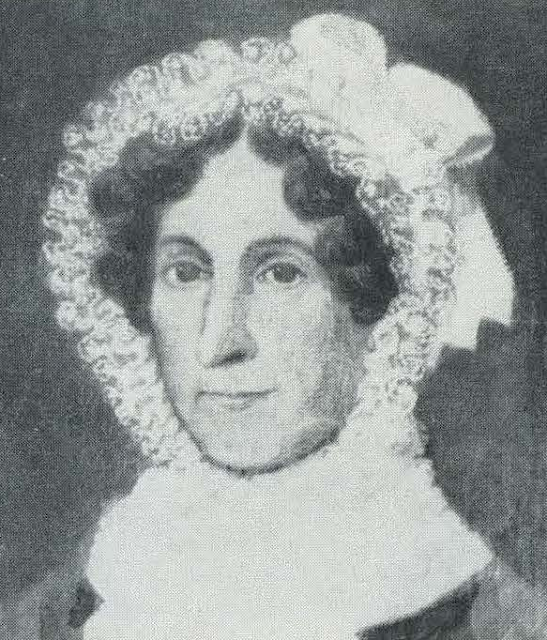 The legality of John Small’s marriage was questioned, and there were even suggestions that White himself had slept with Mrs. Small. Frederick Augustus Berkeley, the fifth Earl of Berkeley, born 1745 and died 1810. Seeking to defend his wife’s reputation, John Small demanded satisfaction, and the two men met on an open field to the east of town on the morning of January 3, 1800. Presumably, both men had an opportunity to recover from whatever liquid revelry they'd downed at their lethal Christmas party. But, there was no recovering from the bad blood born between them - at least, not for John White. Perhaps John Small’s military experience gave him an advantage. He shot John White through the ribs, and White lingered in excruciating pain for 36 hours before dying on the evening of January 4th, 1800. Authorities considered duelling to be a crime, and killing an opponent in a duel was legally the equivalent of murder. However, the laws were irregularly enforced. In early New France, several duellists were imprisoned, banished or executed. Sometimes, even the bodies of men killed in duels were desecrated. Under English law, juries consistently refused to convict duellists if they felt that the encounters had somehow been conducted fairly and honourably. John Small stood trial for the murder of John White – who was, after all, the province’s Attorney General – but was acquitted. His reputation, and that of his wife, suffered for a while, but he remained in York until his death in 1831. John Small’s house in York was dubbed “Berkeley House”, in a reference to the town of Berkeley, in England, where Small had been born. It stood at the southwest corner of King Street and Berkeley Street, which took its name from the house. When Small purchased it in 1795, it was nothing more than a simple wood cabin, but Small renovated and expanded it several times. John Small had a total of five sons, and after his death in 1831, his youngest son, Charles Coxwell Small, took over Berkeley House. Charles Small had Berkeley House converted into a relatively standard Georgian style home. The house had a central portico extending out from the centre, and a gabled wing on either side. In fact, Charles Small renovated Berkeley House so thoroughly, that it bore little resemblance to the log cabin that his father had purchased back in in 1795. Inside, at the height of its glory, the house contained a total of thirteen rooms, and outside the exterior of the house was surrounded by a fenced in garden. 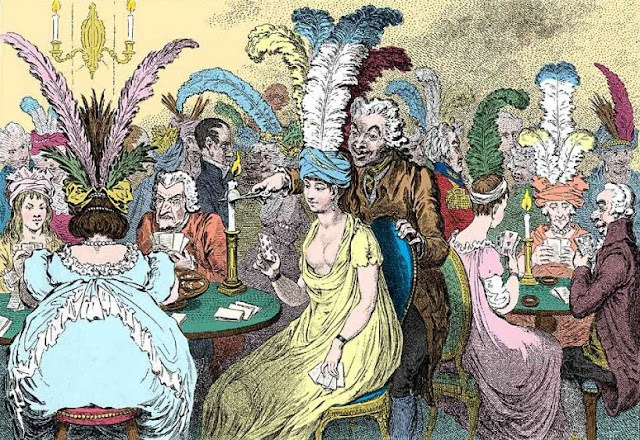 John Small had suffered socially because of his role in the duel of 1800, but by the time that his son Charles owned the house, the social stigma had been forgotten. Charles hosted a number of parties at Berkeley House, and it was the centre of the social scene for the gentry of the old Town of York and early City of Toronto. 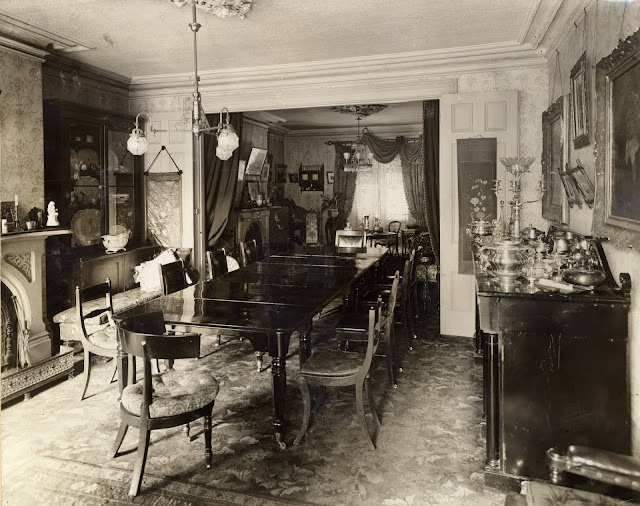 Another photograph inside Berkeley House in 1900. 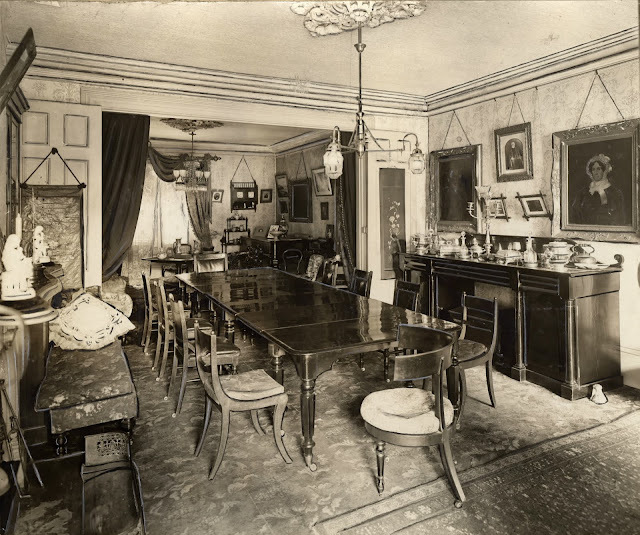 The dining room is pictured here, and on the far wall, you can see the portraits of John Small, on the left, and Elizabeth Small, on the right. They continued to gaze down a century after they were embroiled in the scandal and duel that shocked and thrilled society in the old Town of York. Charles Smith died in 1864. Berkeley House eventually fell on hard times. By the start of the twentieth century, the area that once made up the Old Town of York became industrial. Many of the old homes of York's finest, earliest, families were converted to be used for different trades. At some point, both a lumber company and a grain elevator sat next to Berkeley House. Berkeley House was eventually demolished in 1925. Photographs taken just before the demolition, like this one from 1924, show the exterior stucco falling away in clumps, and the window shutters hanging from the building’s rotting window frames. This photograph from 1924 shows Berkeley House in poor condition. The historic house would be demolished the following year. After Berkeley House was demolished, its foundations were encased beneath a concrete parking lot until 2013. Then, work began on the construction of a new headquarters for the Globe and Mail newspaper. Work on the new 17-storey building was put on hold, while an archaeological dig could be carried out. 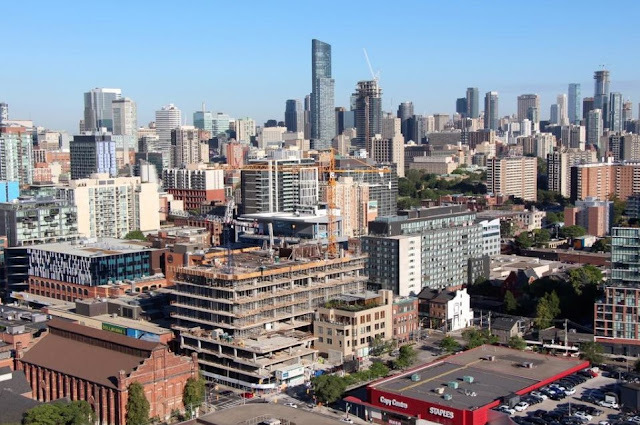 The Globe and Mail building is seen in the centre foreground of this photograph, still under construction. As you can see, the entire area is now surrounded by the glass and steel towers of twenty-first century Toronto. In 1800, the old Town of York was home to less than one thousand people. Today, Toronto has a population in the millions. In 1800, Berkeley House was a small home at the eastern outskirts of town. Today, the sit is in the midst of an ever growing commercial and residential district. Imagine if John and Elizabeth Small could be brought forward over two hundred years into the future, and shown the location of their home at Berkeley House today, and if they could take in the city that has grown up all around it. I'm not sure that they'd survive the shock! After several years of being a "work in progress", I've finally completed a book on the earliest history of Toronto. 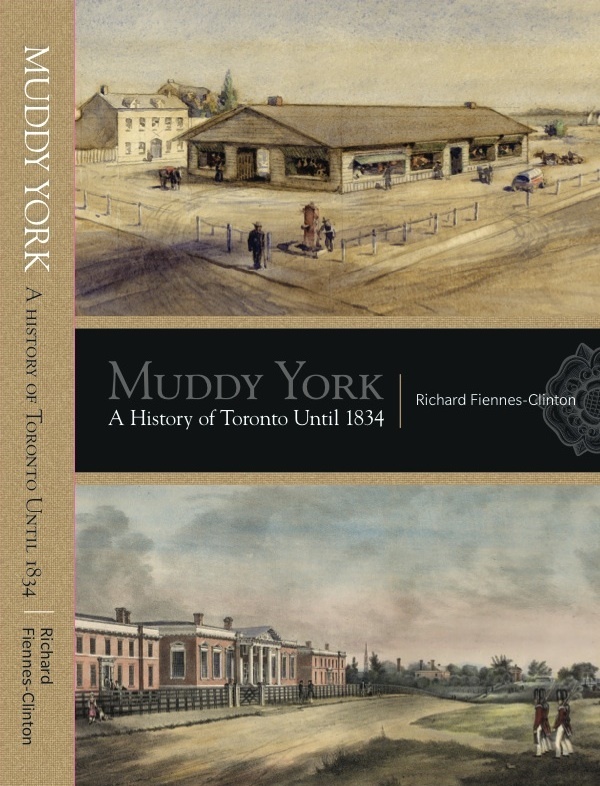 It's called "Muddy York : A History of Toronto Until 1834". The story of the duel between John White and John Small is just one of many interesting tales to be told from this period, and it's included in my book. For more information, or to acquire a copy, please visit the Muddy York Walking Tour website here, join our facebook group here, or email me at richard@muddyyorktours.com. Information on the book's availability should be posted by the middle of January, 2016. Thanks to everyone who has read and followed my history stories online here, over 2015 and before. If you celebrate Christmas, I hope you have a happy one, without any sort of calamity that involves your getting into a fatal duel. Please accept my best wishes for a very happy and prosperous 2016. I am a life long resident of Toronto, Ontario. Back in the 1990s, I started Muddy York Walking Tours (www.muddyyorktours.com), and since then I have become obsessed with sharing the secrets and stories of the City of Toronto. You can find out more about what I do by visiting www.muddyyorktours.com or by e-mailing me at richard@muddyyorktours.com. Thanks for visiting!